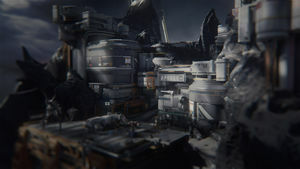 Apogee Station was the primary settlement on the human Outer Colony of Meridian following Liang-Dortmund Corporation's recolonization of the moon. A vast Forerunner structure was located under the surface of Apogee Station. Apogee Station was heavily damaged in 2558 after the activation of a Guardian on Meridian. Fireteam Osiris at Apogee Station.